Wastewater treatment was the most prominent topic at the meeting with citizens, which followed a public hearing on the environmental impact of the expansion of the Calls Creek wastewater plant from its currently allowed 1 million gallons per day of discharge to 1.5 million gallons per day. As the Town Hall meeting progressed on Wednesday evening and Daniells and his fellow commissioners responded to questions, Daniells said the county has set as a long-term goal the building a Rails-To-Trails pathway from Watkinsville to Madison along an unused rail line that parallels U.S. 441. Daniell said he expects to start work on the Rails-To-Trails project in January. Only about a dozen citizens attended the meeting in Veterans Park, and the session became more of a round table discussion than a question-and-answer session. Seven different citizens posed something in the neighborhood of 22 different questions during the 70-minute session. It is hard to count the exact number of questions because of the back-and-forth nature of the exchange. Questions were posed about the need for a full-time Commission Chair, about the value of the Industrial Development Authority, and about Mars Hill Road, Simonton Bridge Road and the Connector and SR 316 interchange. The citizens also asked about the possibility of Costco coming to the county and about county staffing and departmental structure. Tony Greco, one of the organizers of Friends of Calls Creek, asked the first question about the wastewater plant just a little more than 10 minutes into the meeting. Greco wanted to know the county’s plans for the Calls Creek plant beyond the expansion to 1.5 million gallons per day, which is underway. Daniell said the county is working on a master plan at present, but he also said the county isn’t committed to expanding capacity in the future beyond the 1.5 million gallons per day. “If we built a 10 million (gallon) plant we could fill it up,” Daniell said. “Just because there is demand for wastewater doesn’t mean it is going to be there for people when they need it,” he said. The county had proposed building a pipeline down Calls Creek to the Middle Oconee River to discharge treated sewage beyond the 1.5 million gallons per day limit set by the state. Residents of the neighborhoods along the creek have been outspoken in opposition to that plan. Pam Hendrix asked if the county has “truly explored working with Clarke County” on sewer capacity. Athens-Clarke County has a sewer plant on the Middle Oconee River just across from Oconee County. “If we can work it out, we’ll do it. If we can’t, we’re going to stand on our own two feet,” Daniell said. “There’s all kinds of schools of thought on what to do there,” Daniell said. “But we’ll keep exploring any opportunities we’ve got to work with out neighbors, whether its Clarke or Oglethorpe or whoever it is. “But we’re going to keep working toward being self-sufficient as well until that solution comes up,” he said. Daniell told Hendrix that “right now” the county needs a full-time Chair as well as a county administrator, but he is willing to revisit the question in the future. Commissioners Chuck Horton, Mark Thomas and Mark Saxon agreed. Commissioner William “Bubber” Wilkes did not attend the session. Daniell said the county is not considering reducing the number of county employees. He also said the county does not rely simply on fiscal calculations in making decisions about what is right for the county. Daniell defended the record of the Industrial Development Authority. Daniell also defended the decision to rely on the state for the widening of Mars Hill Road, even though that meant following state and federal regulations for the roadway. “That’s a project this government could never have funded on its own,” he said. Daniell said “Mars Hill Road has been a thoroughfare since my granddaddy drove his one-mule wagon down it” and that he had relied on the road to get to Athens when he was a child growing up in the county. No plans are active for an upgrade to Simonton Bridge Road or to the intersection of that road and Main Street in Watkinsville, Daniell said. Engineering work for a multi-grade intersection of the Oconee Connector and SR 316 should start in 2019, he said. Hendrix said she wants to see the county develop a bike trail on the rail line running through the center of the county. “Costco will come when Costco is ready,” Daniell told Dave Jackson, who asked for a status report on rumors the membership-only warehouse club is coming to Epps Bridge Centre. Daniell said other sites in the county also are being considered by the retailer. The public hearing on the Calls Creek expansion started at 5 p.m. in the same meeting room at the Community Center in Oconee Veterans Park as the Town Hall meeting, which started at 6 p.m.
Fifteen people showed up to a technical presentation by James Kizer Jr., president of Constantine Engineering of North Charleston, S.C., of an Environmental Information Document his firm produced for the Oconee County Utility Department in support of its expansion of the Calls Creek plant. The session was a public hearing on the document as required by the Georgia Environmental Protection Division. 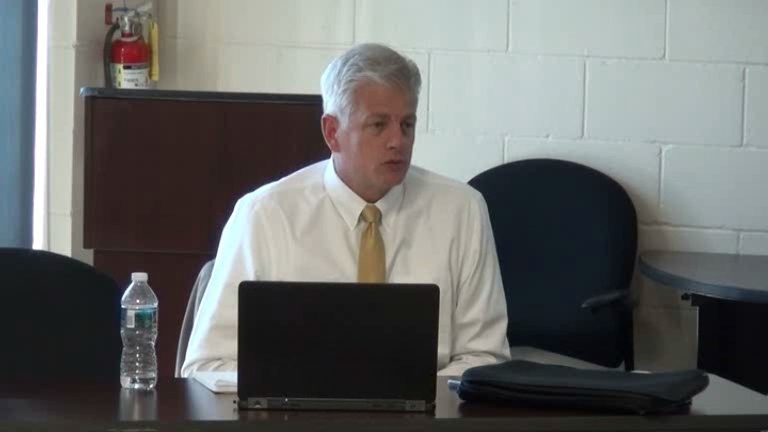 Kizer said that although the state was increasing the amount of water it will allow the county to release into Calls Creek, the standards for the discharge actually are more stringent than those in place at present. Commissioners Daniell, Horton, and Saxon attended the meeting. I attended the Public Hearing on the report by Constantine Engineering, and it is below. 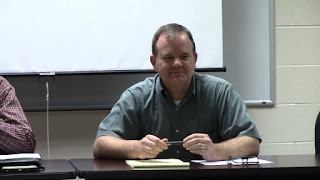 OCO: Utility Department Meeting 10 18 17 from Lee Becker on Vimeo. Sarah Bell recorded the video of the Town Hall Meeting. The question about the need for a full-time Commission Chair and a county administrator is at 1:25 in the video below. The questions about wastewater treatment begin at 11:25 in the video and continue through 38:20. The question about Mars Hill Road, which then digressed into a discussion of Rails-To-Trails, begins at 41:20. The question about Costco is at 53:56. Discussion of Simonton Bridge Road begins at 56:30. The discussion of the Industrial Development Authority begins at 1:05:56. OCO: BOC Town Hall Meeting 10 18 17 from Lee Becker on Vimeo. Thrilled to hear about Rails-to-Trails!! Fabulous!! Rails to trails is a money maker for every community it passes through and a real attraction. Unfortunately, it will not happen in my lifetime, but push it folks!!!! How does it make a great deal of money? Rails to trails brings people who bring money to spend at local businesses, such as restaurants, shops along the way, gas stations, etc. Such paths also help people stay active and healthier and improve quality of life as judged by those who use them. If folks want the to turn the Watkinsville rail line into a walking trail, they shouldn't hold their breath. The rail line that runs through Athens & Oconee is a Norfolk Southern line which is leased to short-line operator. The short-line operator cannot deed that line to the county because it is not his to deed, and Norfolk Southern had no intention of abandoning that line. Talking with my Norfolk Southern buddies, that line fits into Norfolk Southern's long-term growth plan. Ultimately, it will be used as a bypass to avoid Atlanta. To the point: forget Rails to Trails on Norfolk Southern lines. Endless data available on the economic impact of rails to trails. Silver Comet Trail from ATL to Alabama massive success, and Firefly Trail next door to Oconee, from Athens to Olgethorpe, two prime examples in GA. Rails to trails much more effective ROI, return on investment, than the tens of millions of tax dollars spent to subsidize Caterpillar. Even fairly conservative communities in Georgia such as Carrollton are all in for trails. While a member of the Rec. Advisory Board I worked hard 20 years ago on the Rails to Trails program. VERY hard to get to anyone from the RR to talk with. I agree with Anon. 2:29 PM above. Unfortunately not going to happen.